We are the most prominent name in diamond ring and chain sawing services in London, Kent and other part of South East England. We are highly professional, certified and reliable choice when you need quality diamond ring & chain sawing service. Diamond ring and chain saws are hand operated diamond sawing equipment, which can be used for a variety of applications, for both small and big cutting jobs. They are particularly opted over other diamond cutting techniques when there are access restrictions at the job site. Thus, when you need the most efficient and effective diamond cutting alternative for an indoor or outdoor site with confined space, diamond ring & chain sawing is the answer. With these highly versatile handheld saws, you are assured of straight and clean corners. Our handheld saws ensure precise cutting in fastest manner possible; they make an ideal choice for any complex cutting project specifications you may have. Diamond ring and chain sawing don’t require over cuts. Meaning, the job can be done perfect leaving you with perfect square corners in one first attempt, provided the cutting is performed by a skilled and trained diamond sawing professional. And here is when we top the list. Our handheld diamond cutting saws are most up-to-date and most efficient. We are a leading diamond chain sawing specialist. Our diamond chain saws, as the name suggests, has diamond segments instead of teeth as found in conventional saws. They are idea for executing complex cutting jobs. They can speedily and efficiently through thick concrete, rebar, brickwork and stones. 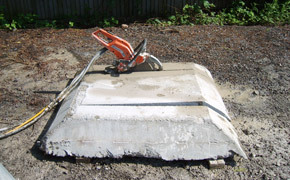 Our diamond chain sawing specialist can help you create openings for windows and doors in reinforced concrete structures or in any other building material. Diamond chain saws are also commonly used for cleaning the corners after performing maximum of cutting process using a wall saw. Chain saws help contractors like us ensure professional finish to all their cutting operations. Our diamond chain saws can effectively cut up to the depth of 650mm. Thanks to its peerless design capabilities, these saws can ensure straight cuts and accurate corners without over-cuts. They make a most viable choice for all kind of cutting applications! Our hydraulic diamond ring saws are a perfect choice to create openings for windows, doorways, expansion joints or to create cuts easing the partial demolition of floors or walls. Our ring saws can obtain the depth of up to 250mm through any construction material. They can also cut efficiently through heavy duty steel reinforced bars. 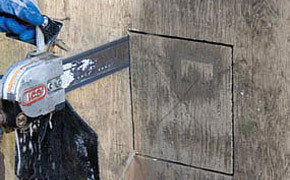 Diamond ring sawing is most recommended technique to remove existing soffits and overhangs; it is also used in shrinking existing manhole rings to required invert levels. With its compact size, ring saw is particularly useful for cutting in limited access area. If you want to create opening for air conditioning ducts or staircases, call out our diamond ring sawing specialist today. Our ring saws ensure fume-free cutting unlike conventional disc saws. Both diamond ring & chain sawing use wet cutting technique, thus avoid production of dust during the cutting operation. The technique produces minimal to no vibration. We have a wide fleet of diamond handheld saws to best fit a host of different applications. To learn more about our diamond ring and chain sawing services, get in touch with our experienced and friendly diamond sawing specialists. Give us a call on 08009750891 or you may fill our quick online form.